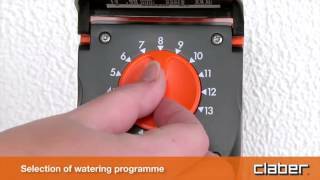 The simplest water timer to use: simply rotate the knob to select one of the pre-set programs, fine-tuned by Claber irrigation and gardening experts. Option of choosing from 15 different programs for all the most common irrigation needs, reading the features summarised in a table on the back of the protective cover. Battery-operated, therefore, no electrical connections required: simply screw it onto the tap. Perfectly watertight and weather resistant, it is already fitted for easy connection via cable with Rain Sensor, which interrupts the program if it rains and starts it again when the rain has stopped. A totally revolutionary automatic one-line water timer containing 15 preset cycles selected using an exclusive control rotary knob. Simply by turning the knob to any one of the 15 numbered notches you can set the program required in a matter of seconds. All the programs available are summarized in a diagram printed on the cover. A led lights up when the timer is in operation. The unit is fitted with a washable stainless steel filter. One 9V alkaline battery can power the unit for an entire season. The electronic components are perfectly sealed. With an operating pressure range of 0,2 to 12 bar, “Aquauno Logica” is 100% quality controlled and tested. Designed for direct connection to the Rain Sensor. Pieces per pack: 2 pcs. Pieces per pallet: 288 pcs.